Only 2 months old! Look at that face! It was like watching a kid stare into a candy store. So funny! In my lifetime, I’ve walked many dogs. I had my own dog growing up, used to volunteer at the Animal Haven in Soho, and would occasionally dog sit for my friends. I know that feeling of clipping on the leash and seeing your dogs tail go crazy in excitement. But so many of us, especially in New York, need help with our dogs. We can’t be home for every time the dogs needs to go out and do his business. What’s more, folks want to make sure their dogs can stretch their legs and get some good exercise. So – we hire dog walkers. Lots of folks look at dog walking as the perfect job. It’s straight forward, the pay can be good and the obvious – you get to be around dogs all day. But after living the life of a full time dog walker for just one day, I’m here to tell you that it’s NOT EASY. It’s not easy being a dog walker for a number of reasons. There’s a lot to remember. It’s not as simple as “Walk a dog.” Keys, pass-codes, which elevator to take, dog personalities, which dog gets what feeding at what time, paperwork – there’s a lot going on. I get tense just thinking about it. After my first day, just being able to keep track of my own schedule and make sure I wasn’t forgetting the important details for every dog was starting to melt my brain. I’m sure it gets easier over time and the more regular your schedule becomes, the better, but still – getting every little detail right takes a thoughtful person. Time off doesn’t come easy. In sickness and in health, in blizzard and in heat – the show must go on. The dog must be walked. Paying clients expect their dog walkers to show up in all sorts of conditions. That’s why they pay them. Of course good clients don’t abuse their walkers, but there’s still a responsibility that each walker has to their client to always be there. Besides trust, reliability is one of the more important traits of a good dog walker. If your’e a walker, you can’t just call in sick whenever you want without making an effort to give your client other options. You can’t make the dog NOT need to go potty. That’s a crime against nature! The stakes are high. Especially in neighborhoods with a lot of dogs, dog walking can be a competitive business. So if you mess up or fail to meet your clients expectations of being on time, sending updates and doing honest work – dog owners can easily take their business elsewhere. And if your reputation goes bust, it might be hard to win that back. Who knows how much bad ratings will affect your ability to get more clients. After a full day of dog walking, I gotta say – I myself am DOG tired. My feet are sore, and I’m already a seasoned New York pedestrian! Still, I’m thrilled that I’m getting to do something I love and the dogs that I walked today are SO great. SO GREAT. I’m writing this just to make sure more people realize that being a dog walker is tough work. It’s a real job that take a good person that’s trustworthy, can think on their feet and knows how to be responsible for a living, breathing thing. Do you tip your dog walker? Helping owners get back on their feet by caring for their pets. Way to go New Yorkers! Hooray for the ASPCA and Rachael Ray! 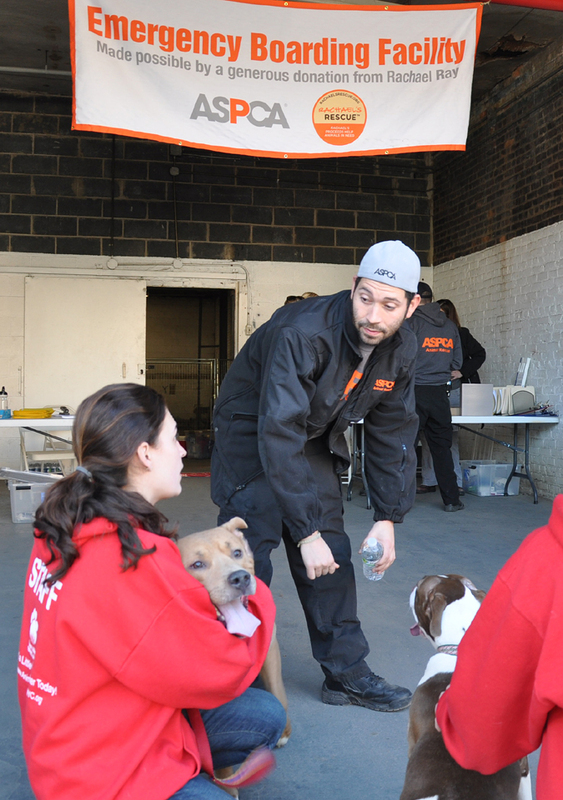 Thanks to a generous $500,000 grant from the television personality and animal advocate, the ASPCA has opened an emergency boarding facility in Brooklyn to help pet owners and animal victims of Hurricane Sandy. 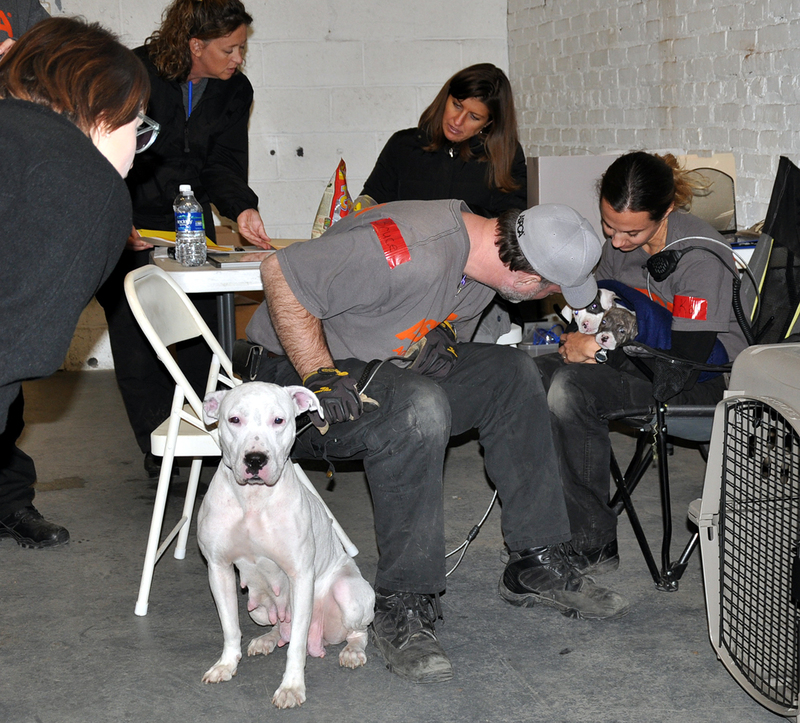 The facility located in Bedford–Stuyvesant opened on November 17 and will provide temporary sheltering for hundreds of displaced animals for 30 days. 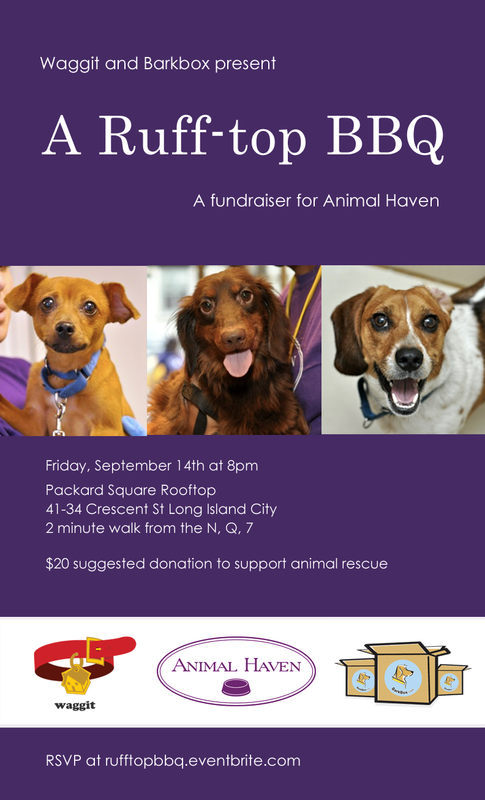 In the wake of Hurricane Sandy’s devastation, I’ve compiled the following resources for those who want to help in the rescue of pets affected by the storm. If I’ve failed to include a resource, please add it in the comments section or on our Facebook group. *As an aside, I realize that not everyone will agree with the policies of some of the organizations listed below. However, in the spirit of saving animals’ lives, I’ve decided to put policies and politics aside in order to help as many affected pets as possible. UPDATE: A list of local emergency pet shelters in affected states. Great tips for getting your dog to love his costume as much as you do. Also applies to dog backpacks or service dog harnesses. Admittedly, this is not one of the more “practical” skills you can use positive reinforcement techniques to teach. Although, because Shelby has undergone this training so many times, when she went through her first heat and had to wear underwear, she accepted it like a champ and never bothered with her latest “costume”, nor did she have any trouble smiling through the cone of shame period. 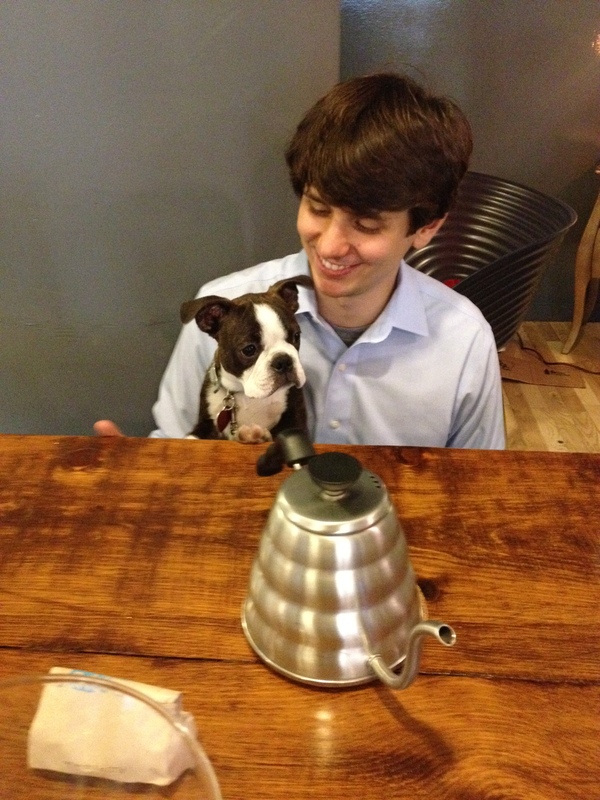 Over the past few months, Waggit’s met some pretty great small businesses that love dogs. And since Waggit’s a small and growing business, we thought – ‘Hey, it’d be really cool to invite some businesses to our office and make people happy with dogs.’ So that’s exactly what we did. Waggit, JoyRide Coffee Distributors and Evermore Pet Food have at lease one thing in common. WE. LOVE. DOGS. Earlier this week, we invited Evermore Pet Food and JoyRide Coffee Distributors to our office in WeWork West Soho for an event we called Canines and Caffeine. Combining our love for dogs and quality coffee, Evermore served up a wholesome lunch for the dogs while their hard working masters drank freshly brewed Stumptown and Blue Bottle coffee. Milk and cookies were served while folks that brought their dogs to work had a chance to hang out and get friendly with fellow co-work-dog-owners. Ike inspects all outgoing coffee. Dogs playing, small business getting to know potential customers, and our dog themed Spotify playlist made the lunch hour a nice time to kick back and have some fun in the middle of the work week. We’re just glad we didn’t have any major accidents on the carpet. 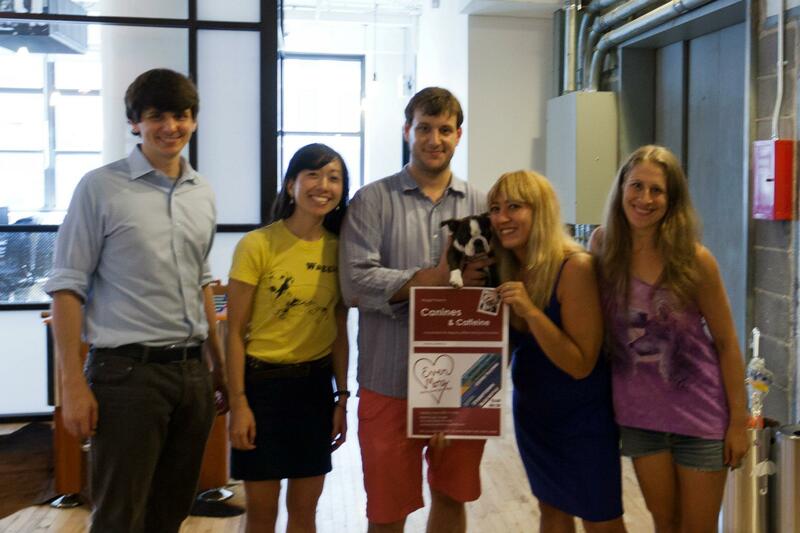 If you’re a small business and you love dogs, Waggit would love to get to know you. On top of our mission to be better to dogs we’re always interested in ways to support local small businesses. Whether you have a local pet boutique, animal rescue group or even a two-seater coffee shop around the corner, Waggit wants to help you get to know your local neighborhood and grow your business. So if you’re a small business owners and you’d like to get involved with the Waggit community, drop us a line at info@waggit.com. We’re a lot like that dog that everyone loves in the park: friendly, eager to please and happy to help. The only thing we don’t do is sniff butts.